For this Wonder The Piano Guys wanted to stay true to this tradition while simultaneously nailing “jungle harmony,” as a famous cartoon bear once coined in…Disney’s Jungle Book! The challenge — to effectively blend the cacophony of Disney Jazz, classical music, Mayan heritage, all while making it epic enough to be filmed in front of a massively-historic, world-renowned stone temple, Chichén Itzá. Steven Sharp Nelson first contacted me to design the cello for the video and I was so excited to be given the opportunity to design this for him to play. The design was the first using a more tonal color palette and elements, to bring the "Mayan" carving theme to life. When I saw the video for the first time, I was blown away by the music, and in seeing my piece brought to life. It was an amazing project and I am so proud to have my work featured in this amazing music video by The Piano Guys. 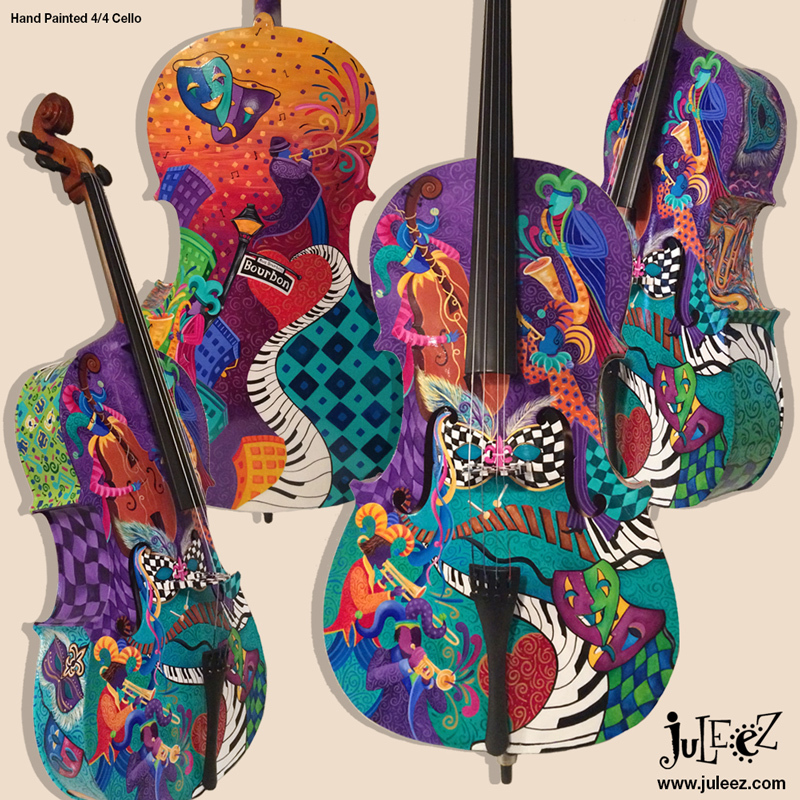 Juleez is pleased to offer custom designed and hand painted violins, violas and string basses by artist Julie Borden, the most recognized artist in creating hand painted instruments. All of Juleez custom musical instruments may be ordered with your choice of designs, colors and themes, or shop other collections for some of my favorite designs. *Each piece is created at the time or order, unless noted it is in stock. Instruments are real musical instruments and are new. I also offer painting of your instrument, please contact me to make arrangements for shipping. Each instrument is finished with several coats of protective gloss clear coat. Please allow 14-21 days to receive your custom painted musical work of art, unless it is in stock. 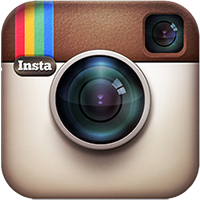 Have an event or need it sooner? Just give me a call or send a message. During the painting process, you will receive email updates with pictures of your instrument in process. Each instrument is finished with several coats of protective gloss clear coat. 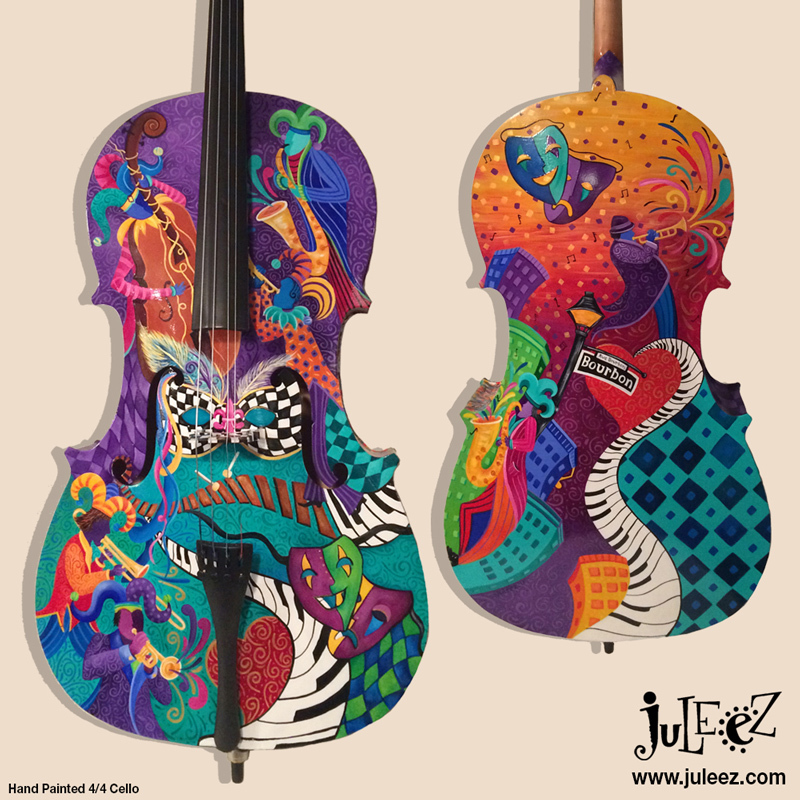 Juleez hand painted musical instruments are playable, but many clients choose only to display them as works of art. Each piece is unique and one of a kind. These fun and spirited musical instruments make a great statement for any collector, performance or music room. 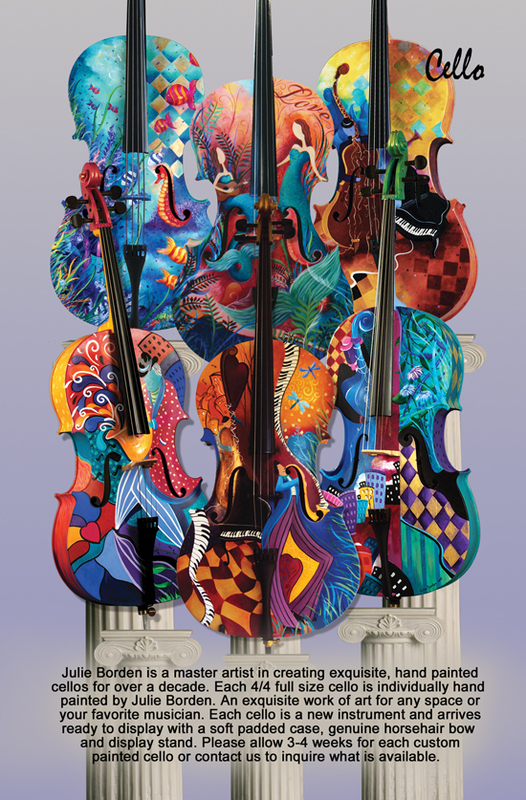 Each cello features a Mendini or Cecilio 4/4 Cello, and all other sizes are available. Any Brand or model may be requested and customized for your piece, so please contact me to discuss brands, sizes or if you would prefer to supply your own violin to paint. Any design can be personalized or several ideas may be combined. After purchase you will receive an email to discuss the details of your custom hand painted cello. Makes a perfect addition to any music art room, a special performance, or for your favorite musician. Still have questions? Would you like to supply your own instrument? Check out directly with PayPal below or if you prefer, you can choose to send a check, or make payment arrangements. Prefer to use a credit card over the phone? Just give Juleez a call or email me with your questions. Thank you and enjoy! 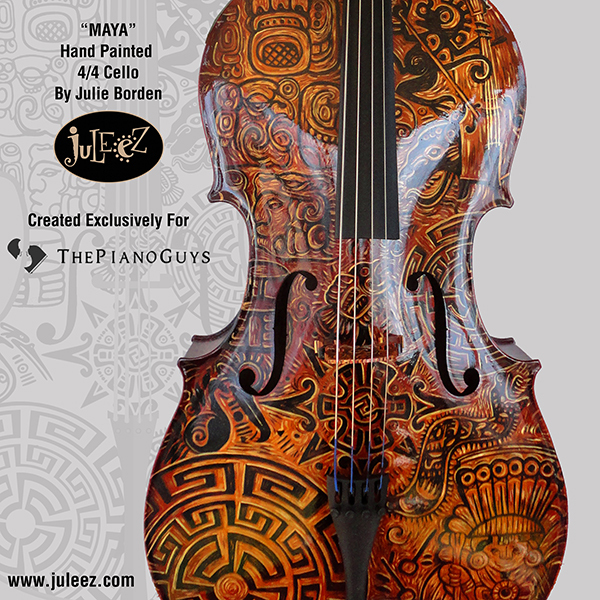 "Steve is playing the most recent addition to his cello family, “Maya,” hand painted in Mayan hieroglyphic style by Juleez (Julie Borden) just for this video. Her uniquely creative masterpieces are only matched by her equally vibrant spirit and enthusiasm for musically influenced art.